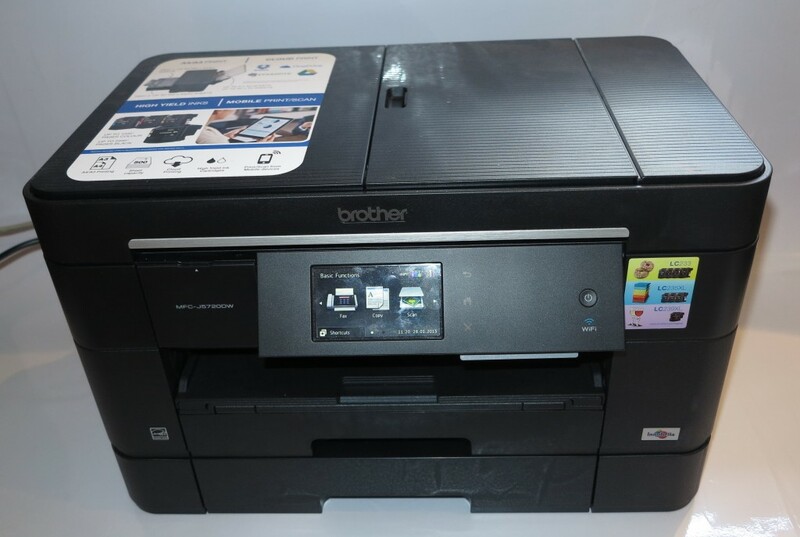 I am reviewing the Brother MFC-J5720DW multifunction inkjet printer which is the second generation of Brother’s landscape-printing A4/Letter inkjet printers. 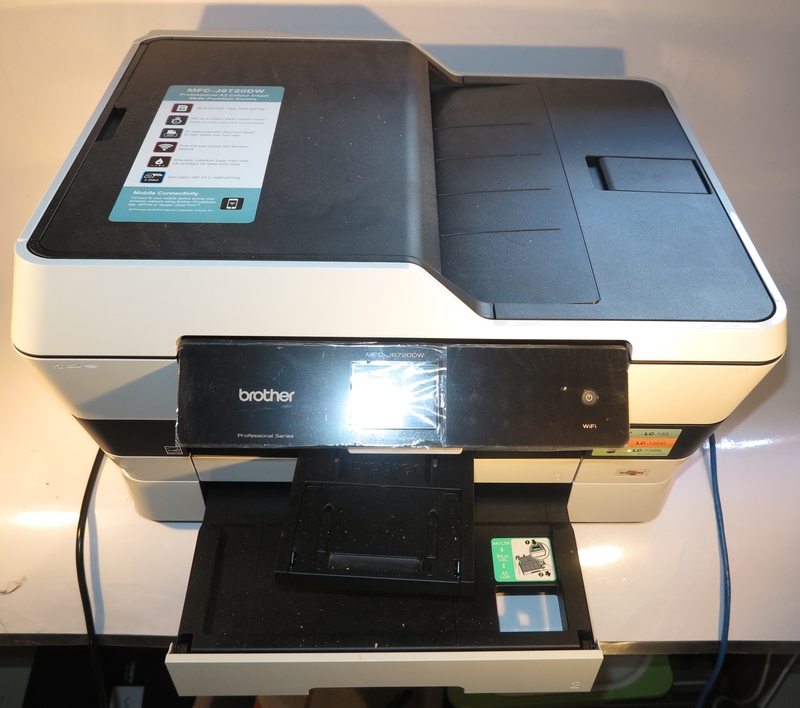 It still has the compact form factor of these printers and can be set up to print on A3/Ledger paper by you either using the feed tray on the back of the printer or elongating one of the paper drawers. 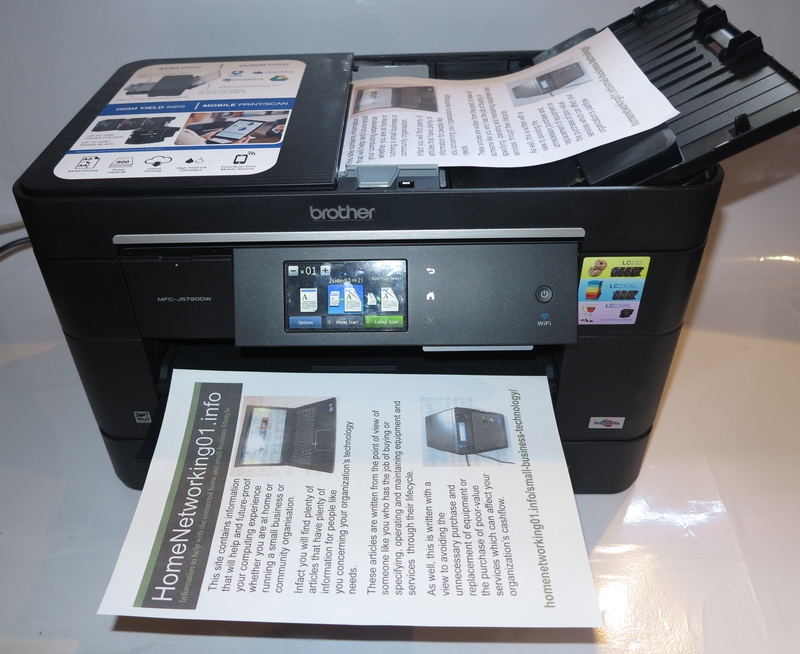 The Brother MFC-J5720DW and the MFC-J5320DW come across as being a highly compact printer that doesn’t take up much desk space. This is thanks to the landscape printing inkjet mechanism which works on the long edge of the sheet of A4 or Letter paper. It also lets them print on to A3 or Ledger paper which can come in handy with signs and other similar work. The model I am reviewing is the MFC-J5370DW which has as its extra features a single-pass double-sided scanner as well as an extra tray whereas the cheaper MFC-J5320DW omits these features. 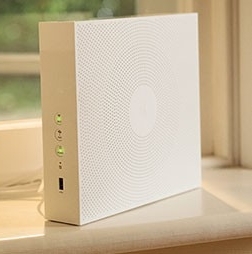 The printer is capable of being connected to a Wi-Fi wireless network with WPS setup or an Ethernet network and I chose the latter more for reliability and the fact that it is better to connect printers that are normally sessile to a network via a wired connectioni.e. Cat5 Ethernet, HomePlug AV or MoCA. 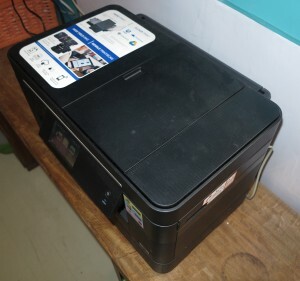 The printer, like other recent Brother inkjets, requires you to lift the lid to connect it to a computer or wired network. This can be confusing but allows you to have it tightly against a wall. Everything about this printer was simple when it came to getting it going for the first time. 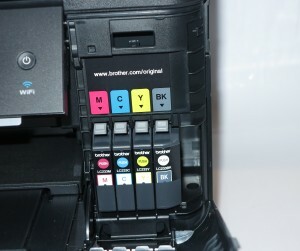 This included installing ink cartridges which are located up front. 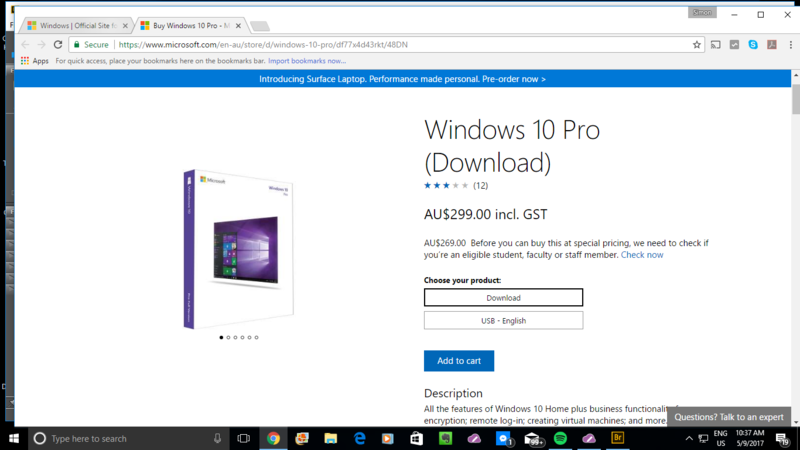 Loaded view – with document in ADF and printed output. The copying function comes through easily because of the use of “one-touch” access to the common copying jobs. The copies come out very sharp and clear but you may miss a few millimetres at the edge and this shows up when I was doing a test ID-copy on a hotel keycard, and this can exasperate users who put documents to the edge to make sure they square up when copying off the platen. Even a duplex copy went according to plan with both sides coming through properly and quickly. Here it achieves the speed goal by scanning to memory before printing. 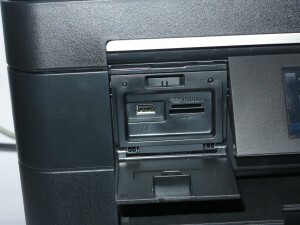 It has the card slots so you can quickly print from camera cards or USB thumbdrives if you just want that picture or document “there and then”. 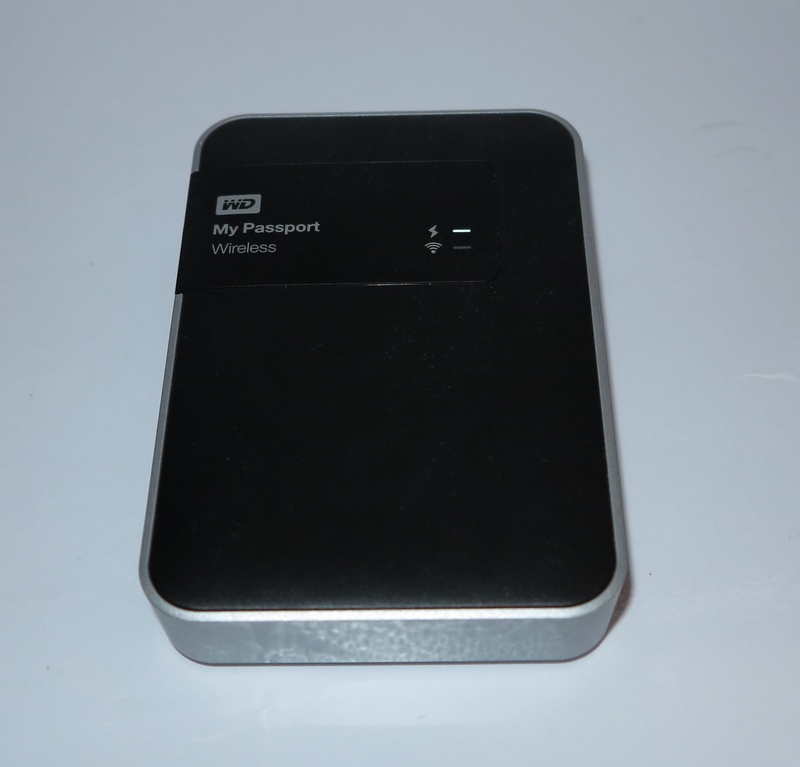 It has access to mobile printing services like Google Cloud Print and Apple AirPrint along with the ability to print from online services like Dropbox, Evernote and Facebook. This is through an interface that Brother has set up for these devices and it allows you to have multiple accounts of the same service set up. The driver software installed properly as long as you specified the model that was being installed and there was the “at-a-glance” layout for driver settings. They also use the ControlCenter scanner software which could benefit from the ability to reorder pages when you are scanning multiple documents or creating a “document-of-documents” PDF file. Brother still maintains the ability to load ink cartridges from the front of the printer like they have done with most of their inkjet printers. This makes for an easy-to-use printer. The only let-down is that they are using newer cartridges which may be disappoint people who are upgrading from previous generations of Brother inkjet printer but have extra cartridges for their older equipment.. The multipurpose tray was a bit hard to use because of the effective availability of two trays as part if this tray. This can confuse anyone who wants to use the multipurpose tray to print a few sheets of paper. I had this printer turn out a large report on both sides of the paper and it didn’t falter through the print job which is an example of a typical office print job. The landscape printing was able to help with improving the printing speed. Regular documents came out of the Brother MFC-J5720DW with the same sharpness that is expected for office documents and this didn’t matter whether the printer was working single-sided or double-sided. It comes across with the saturation for business graphics but could do a bit better when working with plain paper. 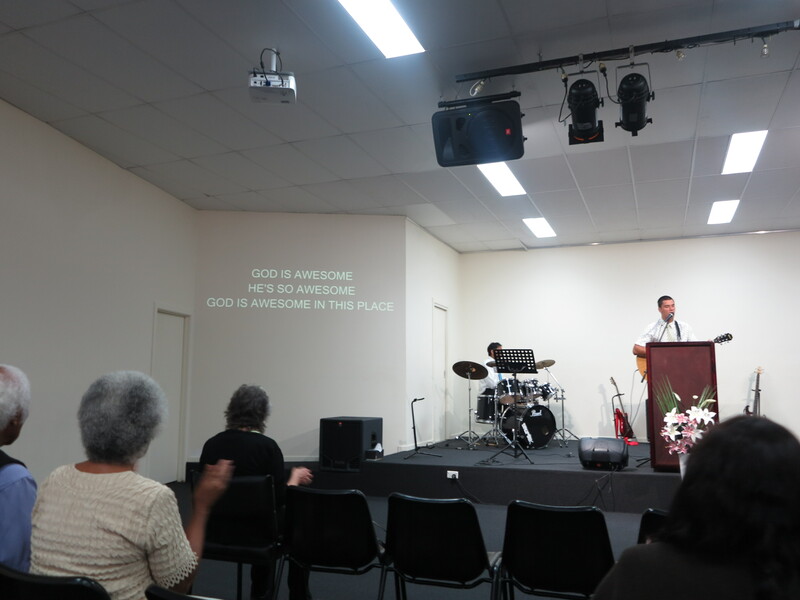 This was from what I observed with a “carols by candlelight” bulletin for the church I go to and I showed my printout of that same bulletin to my pastor who had colour printouts of it done by a local Officeworks and he reckoned that it didn’t have the same as what they provided. I printed out some test photographs on Kodak paper and had still noticed proper contrast, brightness and definition. But it still came across with a yellow tinge which may not play well with some pictures which may impair colour fidelity. 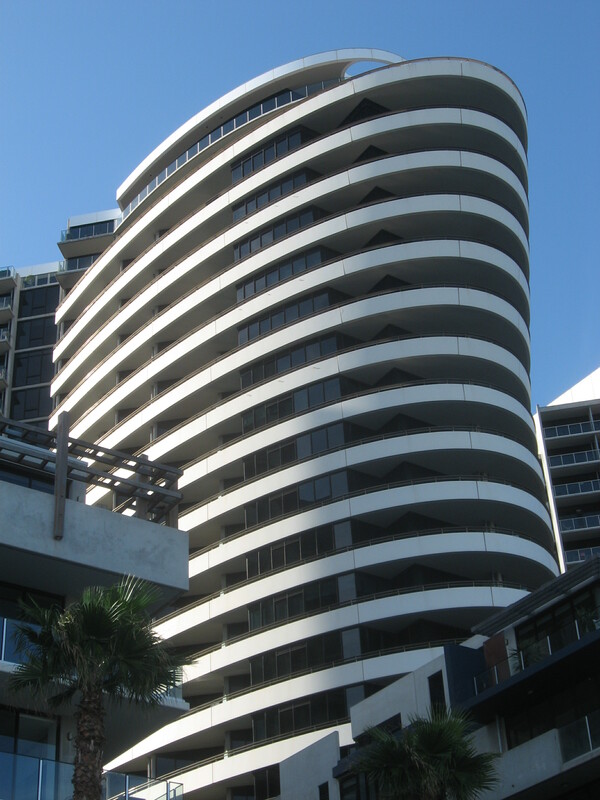 This is although there is the strong colour saturation which may be desireable to make marketing materials “pop”. 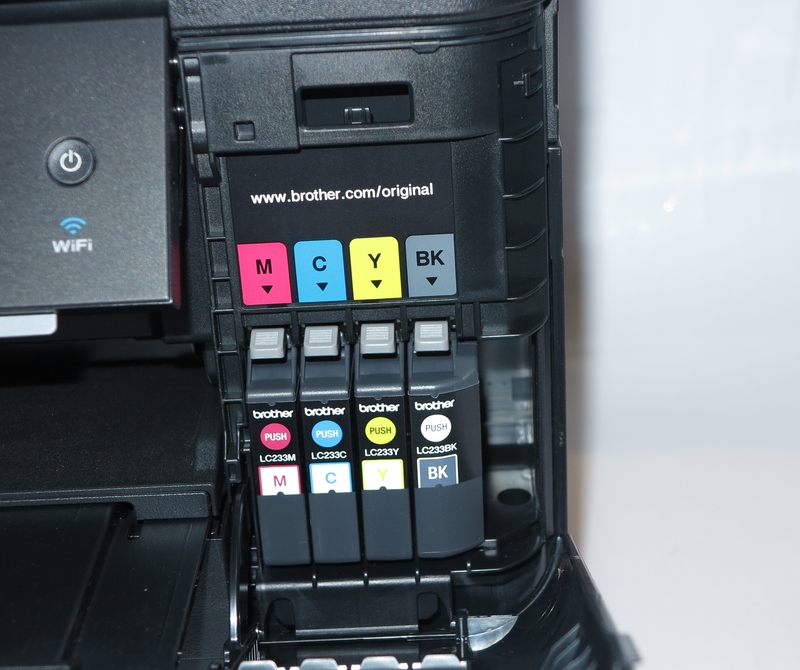 In my opinion, it is getting closer to the HP OfficeJet Pro 8600 Series but doesn’t overthrow it when it comes to a business inkjet printer that has marketing-collateral printing prowess. Compared to the previous generation of Brother landscape-printing inkjet printers, the MFC-J5720DW and its peers have made better strides in print quality for photos and other similar material. 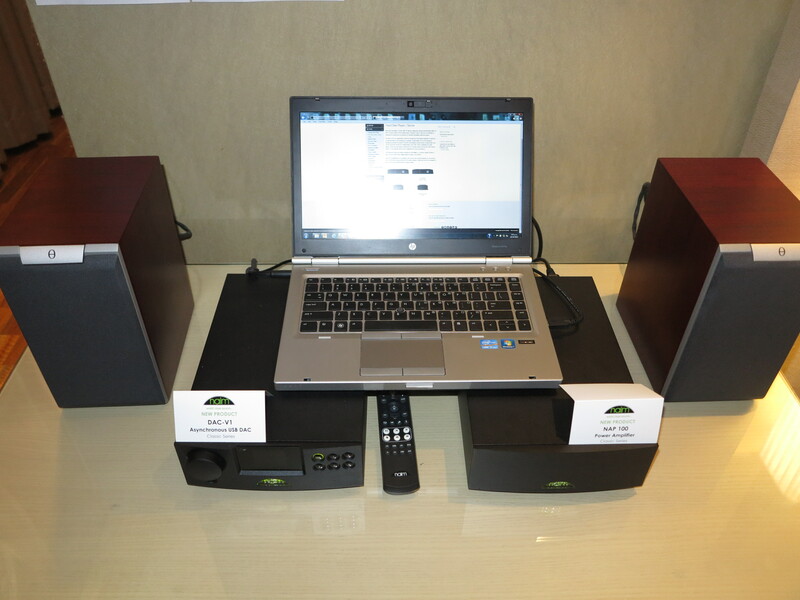 There are still some improvements that Brother could apply to the MFC-J5720DW and its peers. One would be to improve the colour fidelity so that photos don’t come out with a heavy yellow tinge but come out with a proper amount of yellow. As well, Brother could still keep up the work with optimising their colour inkjet and laser printers to turn out the quality needed for them to become the short-run printing press for small organisations. The mechanism can be improved by the use of an output shelf that isn’t integrated in to the paper cassette. This can allow for improvements like a self-retracting output shelf or one that comes out when a print job is being turned out. Similarly, Brother could implement in to their business inkjet printers an A4 paper cassette which has a mezzanine shelf for 4”x6” paper like photo snapshots or index cards. 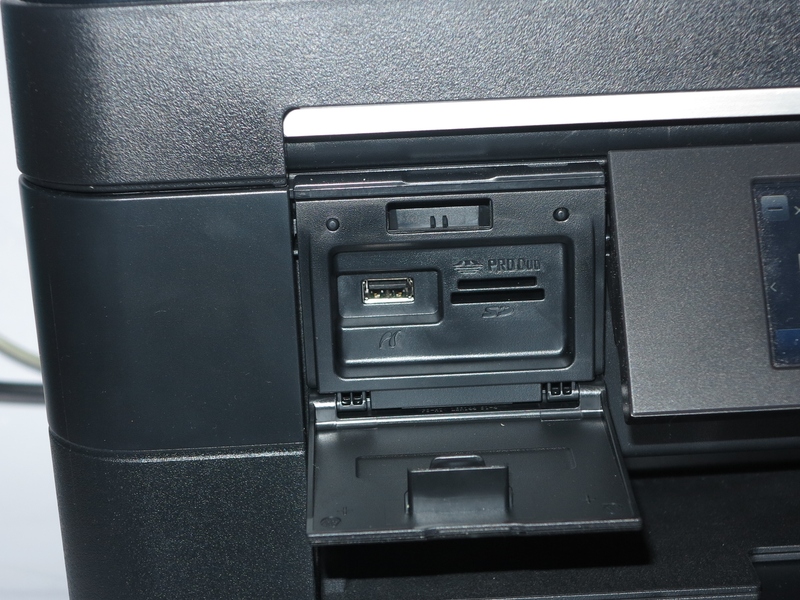 As for the on-machine user interface, it doesn’t come up to the standard of the MFC-L8850CDW colour laser multifunction which has a screen that is very large and useable or the HP business inkjets with their large touchscreens. Here, Brother could improve on this with a large LCD or OLED touchscreen for their inkjet printers. For that matter, printer manufacturers could try implementing OLED display technology on their printer’s control surface in a similar manner to what is being used on a lot of Android smartphones. I would consider the Brother MFC-J5720 multifunction inkjet printer as a all-round office printer for a home office or other small office. It can even satisfy short-run promotional printing needs very easily like turning out proofs or small infill jobs. If you want to save money and can do without the duplex scanning or second paper tray, the MFC-J5320 can satisfy your needs. 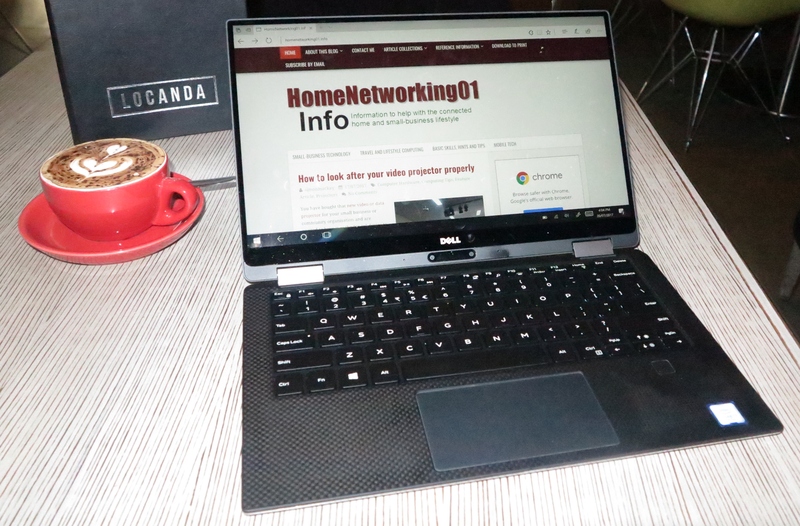 After this review was published and I had promoted the review on LinkedIn, a church pastor had let me know that he had bought this same printer for his home office before I had run this review. I had subsequent conversation with him about his experience with this machine and he has enjoyed using it and took advantage of its A3-printing ability to turn out notices for his church’s noticeboard. He found that it is of better value to use the higher-capacity cartridges especially if you are turning out a lot of A3 material. He also reckoned that the A3-printing feature would end up suiting small community organisations who need to print up material for their noticeboards.